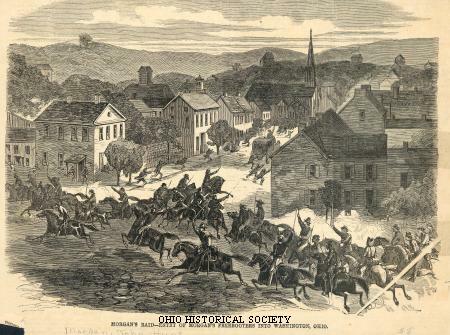 View of the entry of Morgan's Raiders into (Old) Washington, Ohio, from Harper's Weekly, Saturday, August 15, 1863. In July 1863 Confederate Brigadier General John Hunt Morgan led approximately 2,000 cavalrymen on a thirteen-day raid through southern and eastern Ohio. At the Battle of Buffington Island, 190 of Morgan’s men were killed, wounded, and captured, while 140 escaped across the Ohio River. Morgan and 1,100 men headed north after the battle, but 364 of them, including the general, were captured in Columbiana County, Ohio. The Battle of Buffington Island was the largest Civil War engagement fought in the State of Ohio and in the East North Central states of the U.S. The Union soldiers took Morgan and most of his captured men to Cincinnati. The enlisted men were confined in the Camp Chase Confederate prison camp in Columbus, Camp Morton in Indianapolis, Camp Douglas in Chicago, and other prison camps in the North, while Morgan and sixty-eight of his officers were confined in the Ohio Penitentiary. Morgan arrived there on July 30th. He and several of his men immediately made plans to escape. Using table knives, they tunneled out of their cells into an airshaft in November 1863. They remained in their cells until the night of November 27, when Morgan and six of his officers, dressed in civilian clothes, utilized the airshaft to reach the prison yard. They then used a homemade grappling hook tied to a rope fashioned from their bed ticking and scaled the wall. Utilizing some money that had been smuggled into the prison, Morgan purchased a train ticket to Cincinnati. He then made his escape across the Ohio River into Kentucky. Morgan returned to the Confederate army but lost his life less than a year later on the battlefield at Greenville, Tennessee.